Registration for the 2019 pageant is open! for information and to register. The Mr/Ms Special Gwinnett County Pageant is a program provided under Greater Atlanta Pathways Cultural Arts division, supporting our goals of providing a pathway to independent living and a better life. 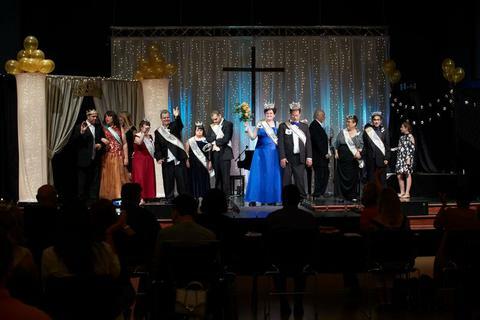 Once again this year Pageant will be hosted by the First Baptist Church Snellville, 2400 Main Street, Snellville, GA 30078 and Greater Atlanta Pathways Inc. a 501c3 non-profit organization in Georgia that provides support and programming for special needs families. Any special needs individuals with intellectual, developmental, or physical disabilities may enter the Pageant competion in one of the following divisions: Adult (16 yrs. and older) category; or SWEETHEARTS couples married or dating, (16 years and older). All participants compete in the presentation and interview sessions. All contestants who have been crowned Queen or King in their category, may not compete again in the same division, but may compete in other categories. The PRESENTATION session allows individuals to pose in their chosen outfit for the audience and judges while our EMCEE reads their bio. The INTERVIEW session allows individuals to showcase themselves through prepared questions. If an individual is non verbal or has verbal limitations, the interview portion is modified to meet their talents. During the year, the pageant’s reigning Kings and Queens make several appearances and participate in community service activities around Gwinnett County. These pathways of opportunity will shape each one of our winners in exceptional ways. Their self-esteem, confidence and public speaking abilities will reach levels beyond what their parents and families dream of! Complete entry form and payment by July 10, 2019. Entry Fees: Single Contestant - $20. Sweetheart Contestant - $15 each. Click here to pay online. Attire: Ladies: A formal dress (prom, wedding etc. ), Gentlemen: A suit or tuxedo. A limited number of resources may be able to help with proper attire. Please contact Mary Womble for assistance by calling 678-549-6813. Rehearsal required participation: Friday, July 26, 2019, 6:00 pm – 9:00 pm. Dinner will be provided. Pageant Participation: Saturday, July 27, 2019, arrive at 5:30 pm. A reception will follow. We encourage you to eat an early dinner prior to arriving. Note: This event is hosted by Greater Atlanta Pathways (GAP), your non-profit dedicated to programs and services for the developmental disability community, and First Baptist Church Snellville. If you are a current member of GAP, there is no cost to compete in the Pageant. If you wish to join GAP or renew your membership, the annual fee is $60. If you wish to join GAP after experiencing the Pageant and learning more about our programs, your Entry Fee will be applied to your Membership Application fee within 90 days of the 2019 Pageant.